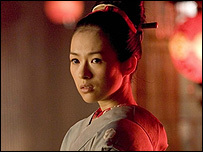 Hollywood film Memoirs of a Geisha has been banned in China after coming in for criticism in the country's media. The decision to cast Chinese actresses Ziyi Zhang and Gong Li in leading roles as Japanese women has caused controversy in China. Critics say it is insensitive because of Japan's atrocities during their occupation of China in the 1930s. The Oscar-nominated film, based on Arthur Golden's 1997 novel, was due to be released next week. The decision follows a reported ban on Oscar favourite Brokeback Mountain, which was judged too controversial to be shown in China, where homosexuality is taboo. Film company Sony Columbia Tristar Pictures said Memoirs of a Geisha would not be released in China "because of the negative social response to the film reflected on various media". "We were pleased with the acceptance of the film in November and were disappointed by this decision," a spokesman for Sony Pictures Entertainment said. Illegal copies of the film are already available in China, one of the main sources of imported pirate film DVDs in the UK. The BBC's David Willis, aspiring actor, mixes and mingles at Hollywood parties.